Attention Valentine's Day Dapper Gents! Get Valentine's Formal Wear. Attention Valentine’s Day Dapper Gents! Get Valentine’s Formal Wear. Dallas Vintage Shop has a huge selection of Gentleman’s Valentine’s Formal Wear like White Tuxedos, White Suits, Red, White & Pink Blazers, Ties, Bow Ties & Cummerbunds, Pocket Squares, Shoes & Hats are available for Valentine’s Day Formal Events, Proms, Sweetheart Banquets and Father Daughter Dances. Nobody has more Valentine’s Day Formal Attire choices in the Dallas area. 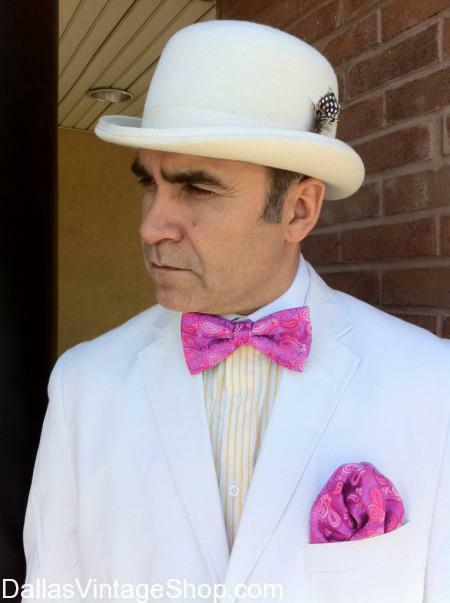 Yes, we definitely have Valentine’s Formal Wear in White, Pink or Red Blazers, Suits, Tuxedos, Ties, Bow Ties & Cummerbunds, Pocket Squares, Shoes, Hats and Vests. There are other extra cool Valentine’s Day Formal Attire Accessories like canes, pocket watches, cuff links and a lot more.